Google has announced The release of Google Nexus 5 which is the first mobile phone to be powered by the amazing android operating system KitKat. 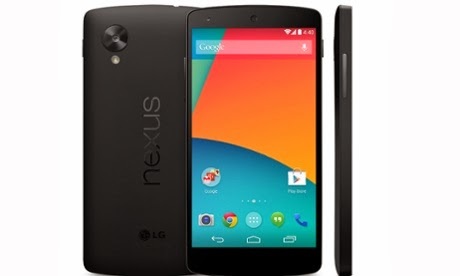 The LG Nexus 5 or Google Nexus 5 is running on Google android operating system V4.4 KitKat, 2.3GHz quad-core CPU. Also equipped with the powerfull Adreno 330 GPU, Qualcomm Snapdragon 800 chipset, with a large display of 5.0 inches Corning Gorilla Glass 3 touchscreen can also be touched with two fingers. The LG Google Nexus 5 has also 8MP rear camera with up to 3264×2448 pixel picture quality and smile and face detection, optical image stabilization with LED flash. It has a 1.3MP secondary camera optimized for video calls. The Nexus 5 is equipped with 2GB ram, with an internal memory of 16 and 32GB depending on versions. It also has a smart 4G internet connectivity support. The LG Google Nexus 5 comes in two colors, the white and black variants. No External memory card support. In what location is it available for that price? Please where can I buy the nexus 5 at this price in Abuja? P.S – please respond to this on and not the earlier comment. thank you.